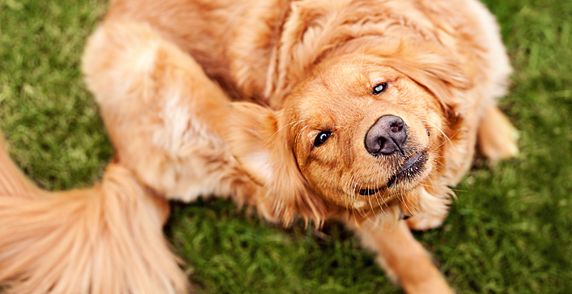 Treat your pet with a flea and tick treatment. There are dozens of brands of flea and tick products available at supermarkets, pet supply stores, and veterinary offices, including shampoos, spot-ons, sprays, wipes, collars, and dusts .Some flea control products are only active against adult fleas, whereas other products can also target other stages of the flea life cycle, such as eggs and larvae. In some cases, your veterinarian may recommend more than one product in order to most effectively kill fleas and break the flea life cycle. Water really does work! Since fleas do not grasp onto the hair shafts, they fall off in the water and drown. A good dip in a tub of water will wash away most, if not all of the fleas on your pet. Using a gentle shampoo will go a long way toward ridding your pet’s body of fleas. If you think you may have a flea infestation but aren’t sure, start by checking your house and yard. Fleas must be completely removed from the affected pet’s environment. Therefore, all other animals in the house must also be treated with flea control products, and the house and yard may need to be treated as well. Vacuuming rugs, throwing out old pet bedding, and laundering other items may also be recommended by your veterinarian to help remove fleas from your pet’s environment. After a run outdoors, thoroughly check your pet for ticks or any signs of itching or blood stains. Be sure to look underneath the hair for visible bugs. To check your pet for fleas, run a flea comb through your pet’s fur and dump any hair and debris onto a white paper towel. Dampen it slightly with water. Any small, dark specks that stain the towel red are a clear indication your pet has fleas. But be aware that the largest part of an infestation – flea eggs, larvae and pupae – are almost impossible to see in a quick check. That’s why prevention is key!